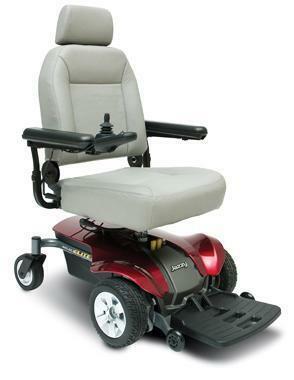 Power chairs are designed to maneuver inside and outside the home, especially in tight spaces. Small turning radius for hallways, bedrooms and kitchens. A stable center of gravity for balance. Joystick controller makes the chair easy to navigate. 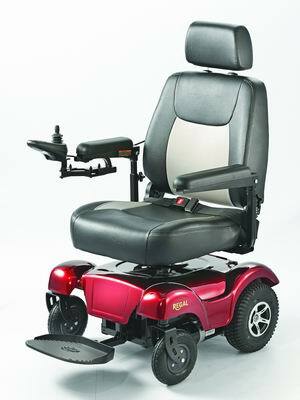 Range of 12-18 miles on one charge (depends on terrain, user weight, model of chair). Most chairs come with solid tires without air so there's no possibility of getting a flat. Easy transfers to and from a bed, toilet or bathtub. You can pull straight up to dining tables, kitchen tables or a desk. Seat sizes: 16"x16" - 22"x20"
Standard seat size 20" x 20"
*Some area restrictions may apply. Call for your specific area. **May require extra medical documentation, certain type of insurance coverage, minimum patient weight, larger doorway and home environment layout or other restrictions may apply.